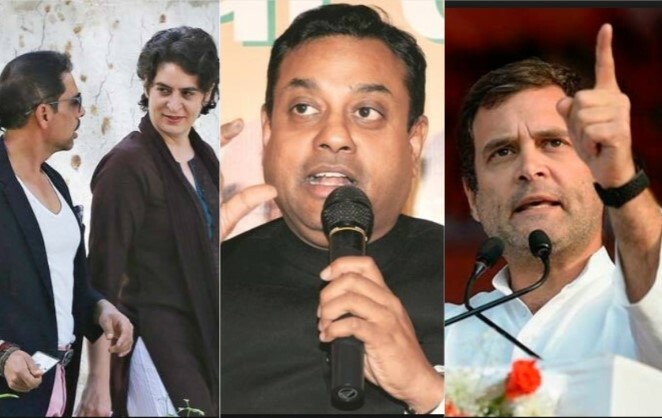 BJP’s Sambit Patra on Wednesday launched a blistering attack on the Congress by calling its national President Rahul Gandhi and his brother-in-law Robert Vadra criminals. His jibe came as Gandhi’s sister Priyanka Gandhi drover Vadra to the office of the Enforcement Directorate for questioning in relation to money laundering cases. Speaking to media, Patra said that both Gandhi and Vadra were criminals. “Posters of two criminals have been put in front of Congress office. Both of them are out on bail; Criminal no.1 Rahul Gandhi in connection with National Herald case and criminal no.2 Robert Vadra who has to appear before ED today in connection with the money laundering case,” he was quoted by news agency ANI. No sooner had he made these comments, the controversial BJP spokesperson began to face incessant trolling. Many social media users were quick to draw his attention to serious criminal allegations levelled against Prime Minister Narendra Modi and BJP President Amit Shah. This loud-mouth moron Patra’s President was in jail for months, was denied permission to enter his home state for 2 years and is an accused serial murderer. If they are criminals then why don’t you put them in jail? First you become a director in the ONGC because of your sycophancy, and now use such filthy language. The use of such language will make every ‘Dr’ ashamed. Two biggest criminals i.e. Modi & Shah are your boss Mr. Patra. What you say on them? Don’t you feel ashamed while messaging such abuses from a continuous abuser? How can he call some people Criminals without trial and conviction? Totally wrong. RSS-BJP people rarely think about what they say. That’s the problem. Priyanka Gandhi, who recently became the AICC General Secretary in-charge of Eastern Uttar Pradesh, on Wednesday drove her husband Vadra to the ED’s south Delhi office. She told a channel that she stood by her husband and by personally dropping him at the ED office, she wanted to send a clear message to the BJP. The ED is probing the allegations of money laundering in properties owned by Vadra in London, where he’s alleged to have purchased posh houses worth Rs 90 crore. Most of the purchases were allegedly made during the government of the Congress-led UPA.